SNHR has published its periodic death toll report for the month of September 2016 in which it documented the killing of1176 civilians at the hands of the main influential parties in Syria. The report notes that SNHR team encounters difficulties in documenting victims from armed opposition factions as many of those victims are killed on battlefronts and not inside cities. Also, we aren’t able to obtain details such as names, pictures and other important details on account of the armed opposition forces’ unwillingness to reveal such information for security concerns among other reasons. Therefore, the actual number of victims is much greater than what is being recorded. On the other side, the report affirms that it is almost impossible to access information about victims from government forces or from ISIS and the margin of error is considerably higher due to the lack of any applicable methodology in this type of documentation. 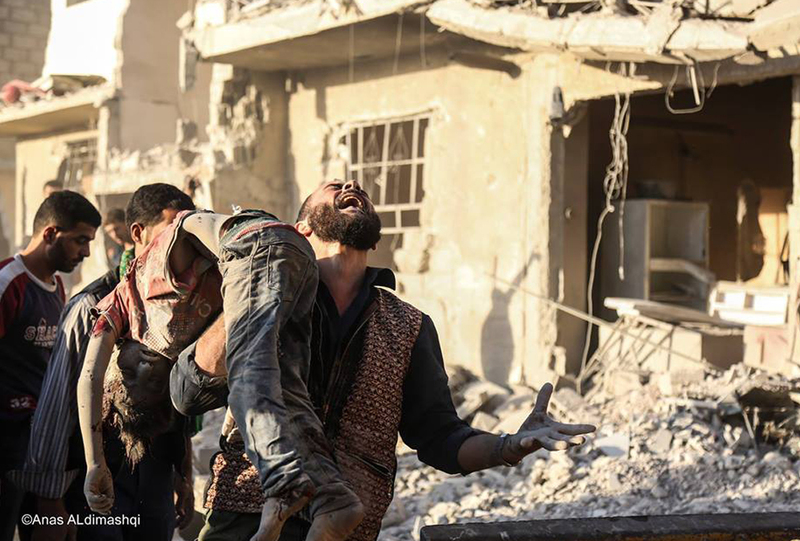 The Syrian government and ISIS don’t publish, reveal, or record their victims. From our perspective, the statistics published by some groups on this category of victims are fictitious and are not based on any actual data. Therefore, the report only incudes civilian victims who were killed by all parties and compare them. Out of the total number of civilian victim, 59% were children and women which is an explicit indicator on the deliberate targeting of civilians by the government forces. The report notes that alleged Russian forces killed 391 civilians including 114 children and 54 women. Furthermore, the report notes that ISIS killed 99 civilians including 17 children and five women while Fateh Al Sham Front killed one civilian due to torture. The report also records that 38 civilians, including 19 children and six women, were killed by armed opposition factions. Also, the report records that 14 civilians, including six children and two women, were killed the international coalition forces in September. The report outlines that 29 civilians, including eight, have either died drowning as they were fleeing by sea or in bombings that SNHR hasn’t been able to identify its perpetrators or were carried out by unidentified armed groups to SNHR. The report emphasizes that government forces and Russian forces have violated the international human rights law which guarantees the right to life. Furthermore, evidences and proofs, according to hundreds of eyewitnesses’ accounts, suggest that 90% at least of the widespread and single attacks were directed against civilians and civil facilities. Also, extremist Islamic groups have committed a number of extrajudicial killings that constitute war crimes. Moreover, some of the armed opposition factions committed crimes of extrajudicial killing that qualify as war crimes. Also, Self-management forces and international coalition forces have both committed war crimes that manifested in the crime of extrajudicial killing. The report calls on the Security Council and the international community to uphold their responsibilities in relation to the crimes of killing that is being perpetrated ceaselessly and to apply pressure on the Syrian government to stop the deliberate and indiscriminate bombardment of civilians. Finally, the report considers the Russian regime, all Shiite militias, and ISIS as foreign parties that are effectively involved in the killings and holds all of these parties and the financiers and supports of the Syrian regime legally and judicially responsible.